With the recent acquisition of the celestial steed, I am thinking again about floating mounts. See, I have the giant ostrich mount from the Blood Elf's. I like to sit in Dalaran on this mount, and squawk at people as they pass by me. This mount (riding it reminds me of the ostrich racing in Swiss Family Robinson) is one of a few land mounts that have wings. I'd love to have Blizzard improve upon this goofy looking mount. When I jump from the top of the stairs while mounted on my Hawkstrider, I'd like to slow-fall to the bottom, no damage. Jump off a cliff, the hawkstrider pops it's wings and we fall gracefully to the bottom. Now this isn't a flying mount, I can't direct my fall, I simply get a buff until I float to the bottom. Questing - Need to get down to the bottom of an area, and don't want to run all the way around. Exploring - When I wanted to explore Darkshore, I flew to Felwood and then jumped down the enormous waterfall down to the bottom. This was extremely painful as you took falling damage 2-3 times, depending on how you landed. Dalaran - as I mentioned earlier, after porting back into Dal from Wintergrasp, if I could slow fall from the top of the stairs down to the bottom and not take damage... cool! 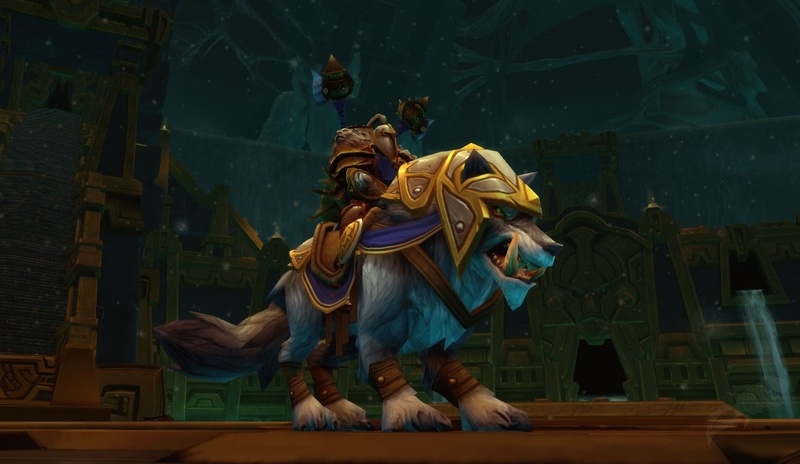 Ok, how about all faction mounts get a buff of sorts. Orc Wolf mounts could get a speed increase when they ran in packs.Or maybe just a slight run speed. Say a 105% run speed. Tauren Kodos could be true 4-wheel drive interior crocodile alligator. No (reasonable) terrain can't be covered. In the age of flying mounts, this wouldn't be that big of deal. Of course, in PVP situations, you may want to make sure you have a kodo..
Raptors would, well I don't know. Eat critters to regen.. How about that, you can feed your raptor mount and making it harder to be dismounted. Also beneficial in PVP situations. For someone with the ambassador achievement, this will not be that daunting. If you are not already exalted, it would quickly get a lot of PVP players, out there, playing all the old-world content or participating in the Argent Tourney dailies to get their rep.
- Human Horses: Nobility ~ When riding your mount in Stormwind, NPCs bow to you. - Night Elf Saber: Stalk ~ When riding your mount, you & your mount can go invisible and walk without being seen. - Draeni Elek (Yeah even alliance can't spell this race properly): Snorkle ~ When riding your mount, you can swim faster & breath under water if you stay just below the surface. - Dwarf Ram: Rocky Mountain High ~ When riding your mount, if you encounter a large hill or Mountainous terrain, the Ram can find a way up. Yeah, I didn't feel qualified to do Alliance mounts. All my Alliance toons are only there for my pet trade ring. One in each major city parked next to the pet vendor, then another in Booty Bay to post them on the cross-faction AH. No. Not a good idea. Would you like it if Blizzard offered a mount that allowed you to summon party members to your side? As situational as Slow Fall is, it's still a Mage skill, and I feel they should keep it that way. Now what racial mount would you put this summoning feature onto? IMHO, sounds like the reverse of a mage portal.